We feel very happy to commence our interview series: Talking to the mathematicians (TTTM) with Indian mathematician, Dr. Kapil Hari Paranjape. Dr. Kapil Hari Paranjape is a Professor of Mathematics at Indian Institute of Science Education and Research, Mohali. He did his schooling from Sardar Patel Vidyalaya, New Delhi and moved to IIT Kanpur to do his integrated MSc in mathematics in 1977. He did his Ph.D. in mathematics at TIFR Mumbai. 1. Junior Science Talent Search Scholarship, 1974. 2. Math Olympiad, DMTU, Delhi 1976. 3. National Science Talent Search Scholarship, NCERT, 1977. 4. General Proficiency Prize for Mathematics, I.I.T. Kanpur, 1982. 5. IMU grant for ICM 1990, IMU, 1990. 6. Associateship of Indian Academy of Sciences 1992-95, IAS, 1992. 7. Fellowship of Indian Academy of Sciences Bangalore, 1997. 8. Fellowship of National Academy of Sciences Allahabad, 1999. 9. BM Birla award for young scientists, 1999. 10. DST Swarnajayanti Grant, 2001. 11. Associate of the ICTP, Trieste, 1999-2001. 12. 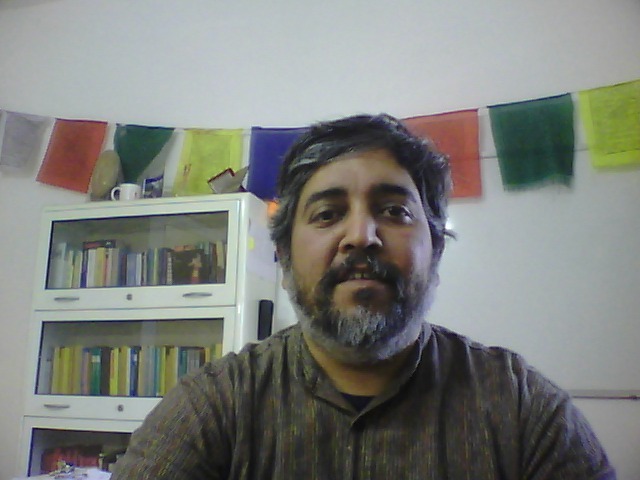 NBHM National Lecturer, India, 2004-2005. 13. Shanti Swarup Bhatnagar Award, 2005. 15. Fellowship of Indian National Science Academy, New Delhi, 2009. 16. JC Bose Fellowship, 2010. Professor Kapil’s research interests include algebraic geometry, algebraic topology, differential geometry, algebraic number theory and mathematical physics. He is also interested in cryptography, logic, philosophy and programming languages. Professor Kapil also has a math blog – Mast Kalandar. But before we begin this interview, Team Dr. Isomorpheus would like to thank some of our friends – Reshma Menon, Sneha Mitra, Tarun Ayitham and Adrian Dudek for their valuable contribution in framing the questions. Now we proceed to the interview. Hitesh(Team Dr. Isomorpheus): How did you end up in mathematics? Did you always want to be a mathematician or was there a turning point in your life? Professor Kapil: It is difficult to remember! My mother had kept an early report card which says something like “He can count properly upto 100, but he has difficulty with basic arithmetic.” I can’t remember a “turning point” of the kind you are looking for. My parents and my sister (older by a year) encouraged me a lot. (All of us are/were very academically oriented.) At some point, it became a matter of pride to try to get 100/100 in Mathematics (which was the only subject where it was possible!) by not making even a single mistake. When I did not (I think it was 7th standard), I cried all the way while walking home. After that, I think I started caring a little less for marks — since I was clearly not so good at avoiding “stupid mistakes”! My sister encouraged me to solve problems from her textbooks and her assignments instead! My father would regularly take us to buy books for various special occasions and I had read a number of “popular mathematics” books like “Figures for Fun” by Yakov Perelman and “Maths for the Millions” by Lancelot Hogben; the books by Martin Gardner were enjoyable too. There were a large number of “Little Mathematics” books from Mir publishers which were wonderful. By this time (9th or 10th standard), I was sure that I wanted to do either Mathematics or Theoretical Physics. (Very little was known to me about computers. I had seen only one book about them in my father’s (extensive) library). Hitesh(Team Dr. Isomorpheus): A lot of people get a good start in their lives but only a few convert that into something big. It must have taken a great deal of determination. Almost all professionals have good and bad times in their careers. Were there any lows in your academic life? How did you manage to keep yourself going at such a time? Professor Kapil: It is certainly true that everyone has difficult times, though what constitutes difficult times may be very individual! As I mentioned earlier, my parents and sister were very supportive, so whatever difficulties I had during school years were handled through their counsel. I can’t clearly remember any solutions (except to mathematics problems!) that I found without their help. The entry into IIT was exciting, but also quite difficult. In 1977, when I joined IIT Kanpur, the country had just had two years of emergency rule. During the emergency years the rules against ragging were very strictly enforced. So our seniors told us that they had been waiting to rag some freshers for two years (emergency was declared in 1975). Maybe they said it just to scare us some more, but it worked to scare us! Most of the ragging was quite friendly, but there were extreme and traumatic incidents. The help from the IIT Kanpur counselling service and the friendship of my batch-mates (whom I had met a week earlier in orientation) helped me get through. question. However, this meant that I was missing classes and that it had its own fallout—the ignominy of poor grades, including Mathematics! Here too, misery has company, and a friend and I counselled each other that the only solution was to attend all classes and value every bit of spare time by following one’s own interests. Both of us did that for one semester and (luckily) did well at the end of it. So I continued to follow that formula for the rest of my stay at IIT Kanpur. This was also a time when I went through a break up. So, in about 2-3 years, it did look as if I would join the ranks of the (unfortunately long-ish) list of young people at TIFR who were considered good when they joined but were “not proving theorems … or even lemmas”! Being part of the film club, learning music and the “chai club” kept me going, but none of these was going to substitute for mathematical results. At this time, I met Sudeshna who joined as a graduate student at TIFR a few years after me and we became close. Her guide-to-be left for JNU the year after she joined. Still she maintained focus and continue to work systematically on the problems suggested. After a while she obtained results. I emulated her to the extent I could. This, and the guidance I received from my professors and seniors at TIFR, helped me to get to solving a few research level problems. The trick of research is to remain focussed on the problem that one is trying to solve, while not ignoring the periphery; sometimes the solution may come from the latter! Luck plays a big role in getting the balance right. After “learning to ride the cycle” one gets going! In comparison with what most people face, the above are probably quite miniscule. However, these were some of the toughest times I have had. Friends, good counsel and a bit of luck helped me get through them! Hitesh(Team Dr. Isomorpheus): This was an interesting and inspirational answer. Thank you very much. It was good to know that you were pretty active in extra curricular activity clubs. You also talked about your mathematical research. You have published a lot of papers and proven a lot of theorems in the last 3 decades. What result of yours are you most proud or fond of? Professor Kapil: I have actually not as much published work as my compatriots—even on average. No excuses for this, I am somewhat lazy about writing things down! Of course, the first result one obtains is what gives one the most joy; that was be the work done in my thesis. I was also lucky to work with V. Srinivas on some nice problems while I was writing (or not writing!) my thesis. However, as a graduate student, I was very intrigued by the Hodge conjecture. So, it is my results on the themes related to this that I am most thrilled about. are still open and a lot of work has gone on around and about these themes. Hitesh(Team Dr. Isomorpheus): True that the first results are the most joyous. Now I’d like to get to the most common stereotype- Mathematicians are crazy. What’s your take on this? Professor Kapil: If “crazy” is meant as the opposite of “normal”, then this is obvious. Very few people in the world become Mathematicians, ergo the latter aren’t normal! However, this also applies to musicians, painters, and a lot of other forms of art. It also applies to a lot of theoretical scientists—a lot of people think of Einstein as a “mathematician”. What makes Mathematics a bit unique among all of these is that like theoretical science, the *value* of mathematical work is determined by a “high-priesthood” and not by the common people. On the other hand the problems studied are chosen for “artistic” value rather than any hard practical reasons. As a consequence, Mathematicians are often isolated in the scientific community for being too “arty” and in the art community for being too difficult to understand! This isolation makes Mathematicians appear additionally abnormal. Another reason is the prevalence of “interesting” stories about famous Mathematicians. The latter are, of course, *more* unusual than the average Mathematician and hence ever more outside the norm. However, one can point to a number of famous artists, Beethoven, Picasso, John Lennon, John Coltrane, van Gogh, Kumar Gandharva and so on to say that they too were far enough from normal to be called “crazy”—and they have been called so by many people! While a number of not-so-famous artists and musicians are known to people, (hence giving support to the belief that not *all* musicians are crazy), that level of mathematician is essentially unknown outside the mathematical community. In other words, only famous (and hence automatically slightly crazy) mathematicians come into the public eye. Having said all this, I must also confess that my motto has been “Be Weird”, at least since I was in 9th standard. Taking unusual perspectives on “common” questions is one way to see them more clearly, and that certainly helps one solve problems! So you can say that I am proud of being crazy, if the opposite of crazy is normal. As they say, “normal is boring”! Hitesh(Team Dr. Isomorpheus): You mentioned being a part of some clubs at TIFR. What do you like to do outside the world of mathematics, now? Professor Kapil: It is true that I was involved with a lot of activities outside Mathematics earlier. However, at IISER, Mathematics education and research have proved to be quite exhausting in themselves! 1. Listen to music of various kinds. Hindustani Classical, Jazz, Blues, Rock, Modern Indian Music (Film and non-Film). 2. Try out various gadgets and software on these gadgets. Of late, I have been exploring the Android system quite a bit. 3. Read books. Mostly Science Fiction and non-Fiction on phiolosphical and scientific themes. 4. Watch some Films and TV. Here too I was always only a spectator! Hitesh(Team Dr. Isomorpheus): It’s still a lot, I guess. Even though you mentioned that you didn’t publish too many papers, your career wasn’t deprived of awards and honors. You have received fellowships of Indian Academy of Sciences, Bangalore( 1997), National Academy of Sciences, Allahabad(1999), and Indian National Science Academy, New Delhi(2009) and awarded B. M. Birla award for young scientists in 1999 and Shanti Swarup Bhatnagar Prize for Science and Technology in 2005. How do you feel about these awards? Do you still get that thrill (while receiving these awards) that you used to get as a kid? Professor Kapil: It is always a pleasure to get an award! How can I deny that? I certainly was happy each time. Does that mean that one should be eager to get awards? As you have mentioned, I have received my share (perhaps more than my share!) of awards, so it may sound crass to answer that by saying that it is best not to be too eager to get awards—in spite of the pleasure that one derives from getting them! Sometimes, the nominee we think of as the most deserving person to get an award does not get it and one question is how one should react to that. I think the thing which mitigates some of the disappointment is if one has the sense that the person who got the award deserved it anyway. I can only hope that most of the people who were nominated for an award which I got felt that way! Hitesh(Team Dr. Isomorpheus): “The person who got the award deserved it anyway.” sounds more or less the best solution to the disappointment-problem. Now lets move to another question. Life is good for only two things, discovering mathematics and teaching mathematics, said Simeon Poisson. What is your approach of teaching or explaining mathematics to non-math people or kids? Professor Kapil: Two different approaches required here. Kids (who mostly have no biases) are different from non-math people. The latter can have all kinds of complex reasons for liking and disliking mathematics, some of which may be based on misconceptions; which makes them a more difficult audience. Teaching in a classroom or lecturing is a performing art. Like other performing arts, it is not enough to be deeply involved with your subject or to be an expert, you must also be able to carry your audience along with you. For this practice and preparation are essential; at the same time, no amount of the p’n’p can prepare you for the “real thing”! It is much easier (and in many ways more fulfilling) to discuss mathematics with others (whether they be younger or older) in small groups. This kind of many-to-many interaction is what can make mathematics fun for all ages, if one gives a chance for everyone to participate. To quote KR Parthasarathy (ISI Delhi), “Mathematics is not banana eating”. In other words, Mathematics is not to be “consumed”, but to be “created”. So one starts with a loose problem statement (or general chit-chat) which leads up to suggestions to solve the problem (or reasons why it cannot be solved!). Of course, a blackboard (or equivalent gadgetry) is essential unless the group is rather small, but all present must have access to the blackboard. The second approach is only possible with kids or people who have an open mind and are unbiased. However, one is often constrained for numerous reasons (and reasons of numerosity) to give lectures even in such cases! Hitesh(Team Dr. Isomorpheus): Now coming to possibly the last question of the interview, we would like your valuable advice for two completely different groups of people. One being the set of people who are afraid of mathematics, the other being the young mathematics students(or aspiring mathematicians). Professor Kapil: I probably do not have any worthwhile advice to give those who are afraid of Mathematics as I have never been afraid of it myself! At the same time, if I look at subjects which I _was_ afraid of, such as literature and some of the humanities, perhaps I can give some advice. Find out what it is that is scary (in my case, it was that I was slow in writing, so it was actually the examinations in the humanities that I did not like). See if you can overcome this aspect by tedious practice. Find out what it is that you like about the subject and follow it up with zeal (in my case, I liked to read — not write!). This may not immediately help you with examinations, but perhaps you can find ways to use what you have learnt. Generally, subjects are much easier to like when one does not have to contemplate examinations in them! It is difficult to give good advice to _all_ young mathematicians since there are so many different reasons why one does mathematics and so many different subject areas. Somewhere, I saw the motto: “Learn with humility. Work with pride.” This applies to the process of becoming a mathematician. “trivial details”—which can take a student days or weeks to work out! So it is important to listen to other mathematicians, even if what they say does not make sense; “record” what is said in notes. Over a period of time, things will start to fit into place. One thing which attracted me to mathematics was its self-criticality. Everything can be questioned and answers can be checked in the finest detail; it is important (as a mathematician) to exercise this right—but to do it on one’s own! In other words, check everything thoroughly and then once again! Do not put “faith” in books, papers or great mathematicians. In the process of doing this “figuring it out for yourself”, you become a mathematician. Hitesh(Team Dr. Isomorpheus) : Thank you so much for the interview, sir.